Hoists, winches, rigging, LiftPull services the Material Handling, Wire Rope Rigging and Industrial Hardware markets in the Gulf Coast. LiftPull services the Material Handling, Wire Rope Rigging and Industrial Hardware markets in the Gulf Coast. LiftPull (Richerson & Associates) have been a manufacturers representative since 1990, representing products to Material Handling Equipment Distribution, Industrial Supply Distribution and Overhead Hoists - Bridge Crane Builders / Distributors and OEM’s. We strive to provide our clients and principals with innovative, value added sales and marketing services. In doing so, we provide targeted product distribution to our customers by using direct personal involvement, various targeted marketing techniques and market analysis. 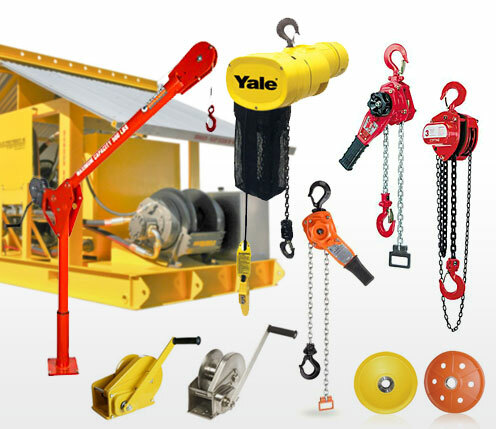 Our products include: Ratchet lever hoists, Hand chain hoists, Wire rope hoists, Electric chain hoists, Trolley hoists, Brake winches, Electric winches, Hydraulic winches, Pneumatic winches, Line spoolers, Davit cranes, Blocks, Sheaves, Lifting clamps, Slings, Tiedowns, Shackles, Chains, Wire rope, Hooks, Clips, Eye bolts, Swage terminals, Magnets, Rigging, Control panels, Cable reel, Hose reel and more.